From Arundhati Bhattacharya, Chairperson of State Bank of India, Kiran Mazumdar-Shaw, Founder of Biocon to Indra Nooyi, President of PepsiCo and Sushma Swaraj, Minister of External Affairs, the women of India have left no area untouched when it comes to holding leadership chairs. Whether it is corporate world or politics, 21st-century women can be found everywhere, displaying a statement to the world that they are second to none. Women, who are considered as born multi-taskers, never fail to bring something different to the table and groom organizations to emerge as vibrant and successful entities. According to a report, there has been a steady growth in women in leadership positions from 17 percent last year to 20 percent in 2018. This clearly depicts the capabilities of the women community and the constant effort they are making to emerge as a powerful human being in our society. Today, with a number of a woman coming out from their homes and choosing to serve multiple roles like a daughter, wife, and mother along with earning their own bread, they are inspiring those thousands of girls who dream of making a mark on this world. Like any other working arena, the education sector also is endowed with some iconic women leaders and administrators who are spearheading the institutions to a path of progression and possibilities. These praiseworthy personalities or to say the unsung heroes in education arena are firmly announcing a journey of transformation by bringing on an undeniable change in the lives of numerous future citizens. Ignoring the gender gap, they are writing a new saga of equality in the country where they are not only concerned about the education quotient of the students but also acting as a guide, friend and a philosopher to young aspirants. 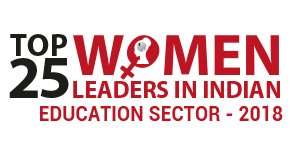 In order to recognize and honor few of such exemplary women personas, we at Higher Education Magazine have come up with "Top 25 Women Leaders in Indian Education Sector- 2018." In the next few pages, we have narrated the untold stories of these women along with a brief on the educational organizations they are associated with presently. We sincerely hope that this endeavor made by us will be able to motivate several young women in our nation. Anuradha Govind, Principal, JM International School New Delhi Leaving an unequivocal imprint on the education sector, Anuradha Govind is stirring up a positive revolution in the world around her by introducing innovative and experiential teaching methodologies. Anuradha Jain, Principal, Mahavir Public Senior Secondary School Sundernagar, Himachal Pradesh An Electronic Engineer who turned into a staunch academician, Anuradha Jain is a synonym for devotion and inspiration. Charu Wahi, Principal, Nirmal Bhartia School Dwarka, Delhi An ardent believer in inclusive education, Charu Wahi is a woman of many parts. From beginning her career as an Elementary Educator at The Shri Ram School, then setting up and heading its Aravali branch in Gurgaon as Junior School Principal to holding the position of Founder Principal at Nirmal Bhartia School (NiBS), Wahi has had a rich, diverse and enriching learning journey. Deepikka Jindal: An Artist with a Steel Fist Haryana Deepikka Jindal is the Chairperson of O.P. Jindal Modern School and Vidya Devi Jindal School. However, leadership in education is only one part of her life. Dr. Kavita Khullar, Principal, Doon International School, Srinagar Srinagar From a dedicated and passionate teacher to an equally passionate administrator, it has been a pleasant journey for Dr. Kavita Khullar. Dr. Kiran Singh, Principal, AVN Vida International School, Gachibowli, Hyderabad Hyderabad, India A multifaceted personality, Dr. Kiran Singh's one of the facets is that of being a visionary educationist. Dr. Monalisa Dash, Principal, Shantiniketan International School, Hyderabad Hyderabad, India Starting her teaching career at the early age of 20, Dr. Monalisa Dash is a versatile educator, who served in the varied role from a soft skill trainer for the management students, IB teacher at Oakridge International School to PYP coordinator and finally as the Principal at Shantiniketan International School (SNIS). Dr. Parul Kumar, Principal, Navy Children School, Visakhapatnam Visakhapatnam A patriotic at heart and teacher by profession, Dr Parul Kumar is a visionary administrator who holds an exquisite dream of making the nation a better place to live in through education. Dr. Sheetal Mann, Principal, Modern Convent School, Delhi Delhi After completing her schooling from APJ, Faridabad, Dr. Sheetal Mann pursued B.Sc in Zoology at Gargi College, Delhi University and stood first in the college for securing highest aggregate marks. Dr. T. Padmavathy, Principal, Fusion International School, Hyderabad Hyderabad, India A Ph.D. holder, Dr. Padmavathy was a gold medallist in M.Sc. Chemistry in the year 1988. Girija Singireddy, Academic Director, Mount Litera Zee high School, Hayathnagar, Hyderabad Hyderabad, India Formerly a Manager, today Girija Singireddy with her professionalism, responsiveness and hands-on approach has successfully turned into a praiseworthy administrator in the education sector. Hema Surapaneni, Principal, The Gaudium School, Hyderabad Hyderabad, India An able administrator and educationist, for more than two and half decades, Hema Surapaneni is dynamic, energetic and forthright in her philosophy on education. She has 20 years of teaching experience and more than six years of experience as the principal. Jasmine Gandhi, Director, Billabong High International School, Noida Noida, Uttar Pradesh An accomplished academician with a rare conception, the presence of an educator like Jasmine Gandhi, makes the mankind trust in the term 'empathy'. Kanchan Dulani, Principal, Sadhu Vaswani International School, Hyderabad Hyderabad, India Kanchan Dulani is a passionate individual who believes deeply in the right of every child to receive an effective and strong education along with values. Kavita Sharma, Principal, JG International School, Ahmedabad Ahmedabad, Gujarat A teacher by choice and not by chance, Kavita Sharma had dreamt of becoming a teacher at a very young age. Sharma joined the Regional Institute of Education, Mysore for pursuing a four-year Integrated B.Sc. + B. Ed programme, right after completing 12th. Madhavi Agrawal, Founder, Cygnus World School, Vadodara Vadodara, Gujarat Hailing from Kolkata, Madhavi Agarwal was educated in Delhi. She did her schooling at Modern School, Delhi and took her BA (Hons.) from Delhi's prestigious Shri Ram College of Commerce. Mohita Sahu, Co-Chairperson, Sapphire International School, Ranchi Ranchi Visionary focus, missionary zeal, and innovative outlook are some of the salient characteristics that can define the illustrious educationist Mohita Sahu. Prof. Sudipta Sarkar, Principal, Kishor Suryawanshi International School, Nashik Nashik Been in the teaching profession for last 22 years, Prof. Sudipta Sarkar is an expert when it comes to improving the students' performances and helping them to prepare for life-long situations. Rupali Dhamdhere, Principal, C M International School, Pune Pune, Maharashtra After schooling, Rupali Dhamdhere did her under graduation in Human Development and Child Development from SNDT Women's University and came through with flying colours. Sakshi Sharma, Principal, Arwachin Public School, Gaziabad Ghaziabad, Uttar Pradesh Sakshi Sharma is recognized widely for her noble works and has been conferred varied awards viz. two Leadership Awards, one International Product and Service Award, Bharat Vikas Parishad Award and Rashtriya Shikshak Saman Award. Shikha Sharma, Principal, Indus Valley Public School, Noida Noida, Uttar Pradesh Shikha Sharma is a visionary educator who is serving in the education field for the last 20 years. Swati Chate, Executive Director, MIT Group of Institutes Pune, Maharashtra An erudite engineering post-graduate and an esteemed alumna of MAEER's MIT College, Swati Chate is highly devoted to the development of MAEER's MIT Group of Institutions, which was founded by her father Prof. Dr. Vishwanath D. Karad, in the year 1983.